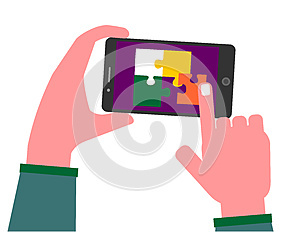 illustration of hand holding mobile phone while playing a puzzle game app. Human Hand Holding Mobile Phone while playing puzzle game. This vector illustration is perfect for magazine, blog articles or powerpoint presentation related to mobile phone gaming, innovation, autism, reasoning and learning.